In this recipe the classical Mexican quesadillas are going to be complemented with an ingredient that comes from the Spanish cuisine “the chorizo". The quesadillas consist of corn tortillas (they can also be made of flour tortillas ) that are folded in half and melted cheese is put in the middle. With the addition of chorizo the quesadillas acquire a point of consistency and a condimented touch – which is delicious and very appetizing. This quesadillas can be enjoyed at breakfast time or as appetizer to whet the Mexican appetite. To make the chorizo quesadillas some ingredients have to be chopped, then the chorizo is fried and at the end the quesadillas are assembled. You won’t have any complication. It is very important to use a cheese that melts to make the quesadillas like the Chihuahua cheese, the Oaxaca cheese or a Manchego cheese, etc. Would you like to prepare the corn tortillas of your quesadillas? You can also prepare homemade chorizo and use it in this recipe. The quesadillas will be ready in 10 minutes . The recipe is for 6 quesadillas. Finely chop 3.5 oz of chorizo, then set aside. Incorporate in the frying pan the chorizo that was minced and fry it for about 5 minutes, until it is moderately cooked; stir regularly. Then set aside. The chorizo tends to release a lot of fat, if this happens remove the fat. Some of the Chorizo that was cooked. 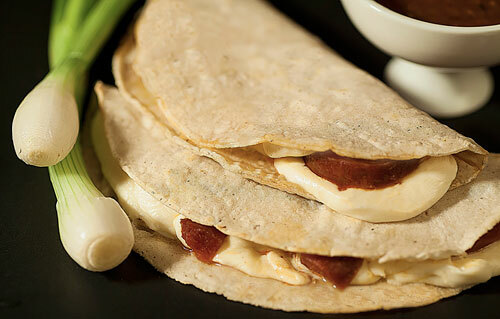 Heat the chorizo quesadillas for approximately 1½ minutes per each side, until the cheese has melted. While the quesadillas are heated they can be pressed gently so the chorizo unites with the cheese and they will heat faster. Suggestion: Taste these quesadillas with the pico de gallo salsa , you will love the freshness of this combination. Variations: There is a quesadilla for every taste as they can also be prepared with: mushrooms , huitlacoche , squash blossom , potato , etc. This recipe may be varied by using hot chorizo; which will give a unique flavor to your quesadillas. We highly recommend using “Tortillas La Banderita" to make the quesadillas. These tortillas are fresh, they don’t break and they have a good flavor. The Chihuahua cheese is mild, it melts great and its texture is fabulous. An ideal cheese for quesadillas.